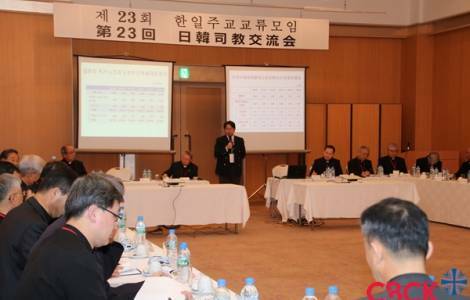 Uijeongbu (Agenzia Fides) - There was talk of young people, of peace, of the proclamation of the Gospel in the 24th meeting between the Bishops of Korea and Japan held this year in the diocese of Uijeongbu, in South Korea, from 13 to 15 November. The local Bishop Mgr. Peter Lee Ki-heon welcomed the participants in the meeting that every year sees the gathering of Bishops of two countries, in the past marked by historical conflicts and enmities, as a sign of brotherhood in the faith and as a will to build a Church which evangelizes in East Asia. The Bishops present had a fruitful exchange, sharing information and pastoral strategies in the Churches of both countries. On the agenda a discussion on the presence of the Christian message in the era of the "fourth industrial revolution", the technological one, while the following day the focus went on youth pastoral care and how to transmit the message of love of Christ to the youth of today, starting from the conclusions of the Synod on young people, recently celebrated in the Vatican. Among the 23 Korean Bishops there was Cardinal Andrew Yeom Soo-jung, Archbishop of Seoul, while among the 18 Japanese Bishops there was Cardinal Thomas Aquino Manyo Maeda, Archbishop of Osaka. As Fides learns, there was an atmosphere of fraternal harmony and collaboration in the meeting, which bodes well for the future.